This blog is the continuation of a small web project for the presentation of the relatively unknown popular music of Eritrea, Ethiopia, Djibouti and Somalia. I had put some songs on that site which were in the RealAudio format. As a beginning of this new blog I will present these songs now in MP3 fomat. 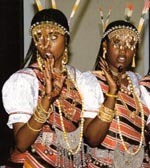 The Afar are one of the two main ethnic groups of Djibouti, but there are also Afar in Ethiopia and Eritrea. For a long time the center of Afar popular music was the town Tadjoura (Tagorre in the Afar language) on the Red Sea cost of northern Djibouti, because most Afar singers come from that town. Fatouma Mansour is an Afar singer from Djibouti. I took the first song from a cassette I bought 1995 in Assayta, which was the capital of the Afar region of Ethiopia at that time1. The cassette is just a copy with the names Abdallah Lee2 and Fatu3 written in Amharic on the cover. Since there is no additional information on the cover the title of the song remains unkown to me. The second song is from Abdallah Lee (vocal & guitar) and another female singer, Medina Habib. This song is from a cassette I bought 1995 in Djibouti. As the cassette metioned above, this one is also only a copy with no information except the first names of the two interprets.